The Pioneer Woman Country Garden Teapot - Just $8.88 + FREE Store Pickup! Check out this The Pioneer Woman Country Garden Teapot at Walmart.com for Just $8.88 + FREE Store Pickup! (Availability of item and pickup depends on your area). 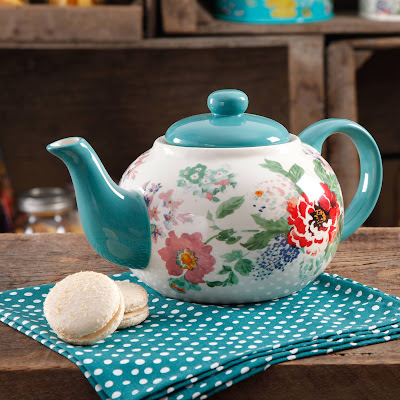 Enjoy serving tea and other beverages in The Pioneer Woman Country Garden Ceramic Teapot. It helps keep liquids hot and can hold up to 23 oz. This lovely item has a classic design that features warm, vibrant colors and an intricate tapestry of dazzling floral designs. The microwave-safe teapot is fashioned of ceramic and makes an ideal addition to traditional or country kitchen decor.